For over a year I have had exchanges with others in my school district that feel the only way to deal with the lack of funding for schools is to close many of them. I understand this desperation stemming from continual cuts to our schools, but we shouldn't give in to this, especially when schools in our most historically under-served communities are the targets. We should not be fighting against each other. We should be banding together to stop the madness brought about by years of disinvestment in public education. But, it is not just my district having issues. In my neighboring community, teachers are on strike. They are the fourth district in the state to face this. They have been struggling to negotiate for a fair contract with those who feel the economic climate is ripe for attacking public sector employees. These are teachers. They don't want to picket and deal with contract negotiations. They want to teach! They are the people we entrust our kids to. Most of them work countless hours, under such enormous pressure and with limited resources. On top of all this, they are dealing with federal and state mandates they never asked for, (and as parents we never asked for). And, then I have my friends in communities that tried to pass levies to fill in some of the holes in their school budgets brought about by decades of disinvestment. Some were successful, some weren’t. In each case, these are community members spending countless hours, door-knocking, phone-banking, and organizing- running themselves ragged. It shouldn't be this hard!! If we truly value public education, then we need to provide adequate, equitable, stable funding. I am frustrated and tired. Our kids deserve so much better, and as citizens we deserve better. People are desperate. We are fighting each other and pitting neighborhood against neighborhood, parents against parents, school boards against teachers, and who does this help? Not our kids. But, those who have no interest in tax reform are probably smiling. The last 5 years saw a 5% reduction in K-12 spending, yet the state's local tax breaks grew by 12%. And, you can bet those who pass “education reform packages” that take our right to vote for state superintendent away, and siphon our tax dollars from public schools to for-profit entities are pretty happy that many have been so focused on their own school's struggles they haven't noticed. Over the past few years, our elementary class sizes have increased by 19%, our high school class sizes have increased by over 28%, and our school districts in Oregon have chopped away at their days, with one district cutting a total of 15 days this year! Music, art, libraries, shop, and many sports, once a part of public school education, are now only available to some, usually through fundraising. These are OUR children, OUR schools, OUR future. As frustrated and tired as I am, I won't give up. This is too important. That is why I hope we band together as Oregonians for the May 31st Oregon Save Our Schools Action Day. This madness must end. Enough is Enough! Things will only get better if we come together and demand systemic change to our inequitable tax structure and fight against the forces that pull our public resources into meaningless school reforms that only line the pockets of private interests. The time is now. Let's do this. 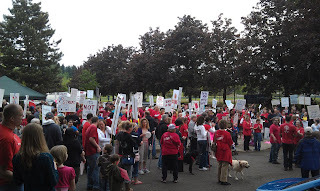 Teacher Adam Sanchez reports on the unfolding battles facing Oregon educators. OREGON TEACHERS are valiantly resisting an unprecedented attack on their schools and unions. Over the last month, teachers in four Oregon school districts have voted to go on strike, while other locals face painful budget cuts that will have a devastating effect on our schools. As of May 21, the Reynolds Education Association, east of Portland, is set to become the third Oregon Education Association local to be pushed to strike in the last month. Negotiations in Reynolds have gone on for over a year with little movement from the school board. A week before the strike date, the school board refused to return to the bargaining table until the Reynolds Education Association brought a proposal that costs less than $4 million, half the cost of the unions' current proposal. The school board, like everywhere in Oregon is claiming a budget crisis, but in Reynolds, the district has $20 million in reserves. There is certainly plenty of money for those at the top. The superintendent's office, which includes her assistant, received a 10 percent salary increase in the recent budget cycle. Administrators' pay increased by 2 percent last year. Meanwhile, over the last two years, certified and classified staff has been cut to finance these raises. Many other issues are on the table that have a lot more to do with union-busting than financial concerns. The board wants the ability to fire teachers based on one anonymous written or verbal complaint. It also wants to eliminate all planning time from student contact hours. In addition, the board hopes to eliminate professional development days and add instruction days, with no additional compensation. Other issues include whether or not teachers should see student information concerning past safety, behavioral or criminal reports. The board also wants to be able to use biased student test scores in teacher evaluations, forbid teachers to take emergency leave days around holidays and ignore seniority as a factor in layoffs. Finally, school officials the power to reopen the contract any time they say they are suffering financial constraints. The list of non-financial issues, in addition to the ultimatum from the school board, has made it clear the school district wants to push the union into a strike. In the aftermath of an eight-day strike in Eagle Point, in Southern Oregon, the Reynolds school board probably thinks a strike will turn the community against the union. But that wasn't the experience of Eagle Point teachers, who said they had more community support, not less. And in the Reynolds district, just last week, 200 teachers and community supporters picketed outside and booed and hissed at the school board meeting. The battle in Reynolds could be a turning point for Oregon teachers after several concessionary contracts negotiated over the last month. The district has a $20 million surplus, nearly three times the budget carryover recommended by the Oregon School Board Association, which gives Reynolds teachers leverage that other locals facing budget crises don't have. THE FIRST two locals to vote to strike were also in the Portland metropolitan area--the Parkrose Faculty Association and the Gresham-Barlow Education Association. Parkrose teachers reached a tentative agreement just one day before they were scheduled to strike in late April. Gresham-Barlow teachers reached a tentative agreement barely three hours into their strike on April 25 after hundreds of community supporters turned out the night before to a solidarity protest. Both unions are taking large concessions. Parkrose teachers are giving up 21 furlough days over three years, though some days could be restored in the third year if public school enrollment increases. Teachers will get only half their experienced-based step raises during the three-year contract, while getting no cost-of-living increases. In Gresham, the new contract also freezes teachers' cost-of-living adjustments while preserving step increases. But in the second and third year of the contract, the step raises are delayed until June 30. On the other hand, Gresham teachers staved off the five furlough days the school board wanted. While the fiscal concessions will be painful, they are not nearly as severe as what both districts were asking for just days prior to the strike votes. Furthermore, both unions managed to win several non-financial contract improvements and prevent large cuts to prep time and other attacks on non-monetary contract language. Unfortunately, the two locals took up one of the concessionary slogans from the Wisconsin uprising, claiming, "It's not about the money," but rather about the prep time and the lack of respect. Many teachers did not have the confidence that they could defend their compensation while their standard of living remained above other workers in the communities they serve. Yet in both cases as the strike neared, the community rallied to teachers' defense, disproving this assumption. In Southern Oregon, the Eagle Point Education Association, representing not just teachers, but bus drivers, maintenance and custodial workers and other classified staff, reached a tentative agreement on May 15 after an eight-day strike. Though the membership has yet to vote on the agreement, the Eagle Point school board successfully pressured the union into big concessions on almost every issue. The three main issues were teacher prep time, subcontracting out bus driver jobs and prorating insurance for part-time employees. The tentative agreement includes a memorandum of understanding that moves prep time to the end of the day. This could require teachers to teach throughout the day from 8 a.m. to 3 p.m. without a prep period. The union was able to win a memorandum of understanding that no subcontracting would occur, but only for the first two-and-a-half years of the three-year contract. In addition, a new pro-rated insurance plan will reduce benefits for part-time employees. Before the strike the school board and the union came to an agreement on the parts of the contract dealing with compensation. Teachers will get no cost-of-living adjustment for the fifth year in a row while maintaining their step increases. But this agreement, reached before the strike, didn't stop the school board and right-wing politicians from painting the union as a gang of greedy teachers who were only striking for more money. They also compiled a bogus set of numbers to claim that teachers had a "pay package" of over $92,000, which works out to $68 per hour. In reality, a starting salary for a teacher in Eagle Point is $34,277. Even those at the top of the salary schedule, who have a master's degree and 14 years of experience, make only $66,412 per year. Yet in robocalls to parents, the schools board claimed, "Teachers only have to be in school for six-and-a-half hours a day. Teachers only work 190 days a year. On average, a teacher makes $68 an hour with benefits, four times more than the community average. Does that sound like overworked and underpaid to you?" In an e-mail blast to over 450,000 Oregonians, Republican state Rep. Dennis Richardson sent out a lengthy anti-union rant in which he stated, "It is my opinion that the citizens should stand with their School District and resist the union's threats and bluster. If the teachers believe a $92,000 annual pay package for 38 weeks of work is too low, let them walk off the school grounds and strike." Yet Richardson and others who claim to be concerned about the district's financial resources had nothing to say when the district that is supposedly strapped for cash poured money into security guards, and training, transportation and housing for substitutes who were bussed in from around the state and paid $330 every day to scab on their fellow teachers. Despite the concessionary temporary agreement, the strike led to an increasingly active union membership. According to Jay Schroder, a Language Arts teacher at Eagle Point High School, "On our first day back to school, every staff member at each school gathered outside the doors and walked in together at 7:45, and left together at 3:15...As I expressed to the membership at the end of the day on Tuesday, to a resounding cheer--the district has given us a gift; they've given us the gift of a strong union. We are together in a way that I have not seen in my 12 years in D9." WHILE SOME locals in bargaining years are being driven to strike, others are being forced to reopen contracts to stave off layoffs. In Portland, Oregon's largest teachers' union reached a three-way deal with the city and the school district. Teachers will delay their step increases, saving $2.5 million, the district will find an additional $2.5 million to cut from the central office, and the city council will contribute $5 million out of the city budget. The one-time deal was made to stave off 110 teacher layoffs, but will ultimately lead to an even bigger budget hole next year when Portland teachers are bargaining for a new contract. In Beaverton, Oregon's second-largest teachers' local signed a new two-year contract that exchanges pay cuts and nine furlough days to prevent potential layoffs. Yet the budget crisis in Beaverton is so severe that school leaders still claim they will need to eliminate 344 positions across the district. But for all the talk of budget shortfalls, the crisis facing Oregon's schools is political, not financial. As a new report by Our Oregon points out, over the last five years, tax breaks for corporations and the rich have grown by 12 percent while school funding has dropped by 5 percent. Beaverton, where the cuts to schools are most severe, is where sports giant Nike is headquartered. The mammoth multinational corporation paid a state income tax of 4.9 percent from 2008 to 2010. Precision Castparts, the other Fortune 500 Corporation headquartered in Oregon, paid a state income tax of 2.9 percent. In fact, the CEOs of these companies could singlehandedly save our schools. Nike cofounder Phil Knight is the 60th richest person in the world, with a net worth of $13.1 billion. He could fill Oregon's entire $3.4 billion budget deficit, double the salary of all teachers in Oregon (roughly $1.48 billion per year) and still be a multibillionaire. But rather than campaign on these obvious issues, the Oregon Education Association has chosen to focus on repealing the state corporate tax kicker--an uninspiring legislative agenda that will not likely generate any money for Oregon's schools in the near future. The OEA abandoned proposals for more substantial tax reforms, like extending the temporary tax hikes on corporations and the wealthy passed by Oregon voters in 2009. Meanwhile, Oregon's Democratic governor, rather than pushing for more education funding is focused on setting up unfunded mandates for Oregon's schools. In order to receive a waiver from the federal No Child Left Behind (NCLB) law, the governor pushed through an education bill that created "Achievement Compacts"--which seem remarkably similar to the punitive provisions of No Child Left Behind. As Reynolds teacher Tricia Snyder-Neiwert writes, "In this brave new world of the NCLB waiver, schools will compete for state dollars; schools who don't meet outcomes will be put into receivership; the waiver will still rely on high-stakes testing to measure student, teacher and school success; schools will still be labeled; curriculum will continue to narrow; and our precious resources will go into data collection, new assessment and testing programs, and new curriculum and training." With the focus on increased testing and accountability, and the refusal to tax the rich and corporations, teachers and public schools are being set up to fail. In a state that already has the 5th-worst class sizes in the nation, this corporate attack on education is pushing teachers and students to the breaking point. THIS IS why it is so crucial that Oregon's teachers are beginning to use their most powerful weapon--the strike. As Eagle Point Spanish teacher Megan Williamson put it the night before she went on strike, "I'm willing to go on strike tomorrow, because I'm standing up not just for myself and my colleagues, but for my students, for my own child, for the health of education in this country. I want to provide the best quality education I can as a teacher, and I will not tolerate a watered-down educational system." We came into this situation under-organized and under-prepared. Even after our strike vote, up until they closed the schools and kicked us out, we were all pretty optimistic that we could reach a settlement. We've had other down to-the-wire bargaining experiences, so this wasn't a particularly new thing for us. But something has changed. This isn't bargaining as usual. Our bargaining team has bent over backwards trying to accommodate the district's demands, but no matter what we've offered, even when we give their own language back to them, it isn't enough. They have forced this strike now because in this economic climate, they believe they can break the union. In letters home to parents, in robo-calls made through out the district, in lies to the news media, and in Dennis Richardson's e-mail blast, we have been slandered as lazy, greedy, despicable, unreasonable, and dangerous. The latest message is that the striking employees are simply gullible tools of a nefarious union conspiracy. It's brutal and it's awful, and it is shocking. Our opponents are organized, well-resourced, have been planning this for a long time, and will go to no ends to break us if they can. Be ready. It's that in order to begin winning strikes--and winning a better future for Oregon's schools--a much higher level of organization will be needed. Over the last year, several new groups have formed with that goal in mind. One example is Portland Area Social Equality Educators, which is bringing together educators in several school districts to collaborate in building union power. The group planning a march on the national office of anti-union, pro-corporate Stand for Children. 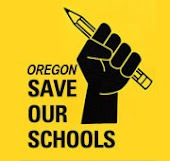 Other groups organizing teachers, parents and students together like Oregon Save Our Schools and UPSET will be crucial in building a broader movement to save public education. Those concerned about Oregon's public schools should join these organizations and help to deepen their roots in communities across Oregon. We must demand that the richest nation on earth allocate enough resources to compensate its teachers adequately and to provide every child with a meaningful, holistic education.